Would you say that avoiding intense pressing for the time you did/have has helped your progression with Deadlifts? Nonetheless, even if one could advance on more, perhaps we are more limited to "give our all" than we want to admit. Nah, sounds like a much more advanced technique, when nothing is moving. One note on the "good girl/bad girl" machine. Ditch the machine and use the low pulley cable with an ankle attachement to do the hip adduction and abduction. Anything that limits your path of movement as much as that machine does is not something you want to do for "stability" muscles. You know I was wondering about that, why not just use pulley or resistance bands? If we're talking about doing it at home, I can just as easily use bands, is that just as good as pulleys? KenDowns wrote: You know I was wondering about that, why not just use pulley or resistance bands? If we're talking about doing it at home, I can just as easily use bands, is that just as good as pulleys? Yeah, that's the usual trade-off between pulleys and bands. At any rate my trainer says pulleys or bands are just as good as the squeezer/spreader machine. Lots of stuff to report from going to a trainer. First, if you can believe this, a gym opens down the street (like 1/2 mile) that is a pure powerlifting gym, bowls of chalk near the dead platform and power cages, and all of the trainers are veteran powerlifters. So it's been a fun 4 sessions so far. Apparently I don't have any. Recommended action was supersetting neutral-grip chins with bb/db lat pullovers. That's going to be brutal. Regarding chins, trainer recommends 2-3 sets keeping a couple in the tank, and then going to failure on last set. This is truly an exercise you cannot do by watching and mimicking. I feel like we've torn it down and started from scratch. I finally know what people mean by "pulling" the bar downward while spreading it. This goes back to not having any lats, or knowing how to activate them. With shoulder injury not healed, bench will be with 20# bar purely for form practice, if I even do that much. Still leaving standing press out completely. Seems trainer and I have the same feeling about deload: every other cycle for 5/3/1 for as long as that works, then we change it. So these guys have completely sold me on competing in November for a meet they are trying to organize. Trainer says stick to 5/3/1 until 8 weeks before competition, when he will give me an 8 week program to prepare for the meet. I'm a bit jealous to you at this moment Kenny. That sounds pretty nice. Remeber to share some great tips you noticed are clearly working. Dub wrote: I'm a bit jealous to you at this moment Kenny. That sounds pretty nice. Remeber to share some great tips you noticed are clearly working. 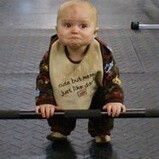 Dub: the best stuff I've gotten so far is simply to do DL accessories on squat day and vice versa. This has done wonders for my progress on both. Another thing that contributes greatly is the atmosphere of a real powerlifting gym, the so-called "X-factor" is a real thing. Funny thing is that most of what he tells me I've heard here, but the 1-on-1 gets more specific and makes it more real, if that makes any sense. Also, I've learned I can do a lot more than I thought, which you find out when you're ready to quit a set and he says, "oh, you're doing 15 of those." In other news, the gym is looking to put together a competition in November, which is not solidified yet, but my trainer asked me today about my weight. I told him I was 170, and I know the weight class break is at 165, and he said, "Yeah you got a few pounds you can lose." So that sounded like a new assignment. Holy *** my shoulder feels normal today! Like completely normal! I've accepted there are good days and bad days, even good/bad hours, but the trend has been a jagged upward line, and today hits a new high point. Think I'm getting a feel for the circuit concept finally. You want a weight that will seem not heavy enough after the first set, so you can hop to the next exercise with no real rest, and by the third set you should be really struggling to keep form and complete the same reps as set #1. For uppper I'll stay with 5/3/1, using accessories provided by my trainer, which will be in the logs this coming week. 1) trainer wants my max weight lifts on lower body to be with him on Saturday, for observation and coaching. 4) Each week on Saturday we'll build up to max singles and go for a PR on two variants such as box squat and deficit deadlift. 5) LEG DRIVE! It's all about leg drive. We're working on his observation that "you have the lower back of a 420# deadlifter and the legs of a 320# deadlifter." 6) The combination of a west-side like max effort day on Saturday and a volume day on Thursday is supposed to cover pure strength with heavy singles and mass/hypertrophy with the volume day. If you do a really heavy leg day, and do triceps afterwards, you can't really tell if your shoulder hurts. My current program would best be called "Tribute to Dan John". 1) Found with my trainer that progress stopped after 5 weeks, going to try a five week cycle. 2) Basically sticking with one assistance per heavy lift, using Dan John's philosophy, "Low reps with high weight is good, high reps with low weight is good, high reps with high weight is best." 3) Except for main lift and its accessory, all other exercises for the day will be either sprinting or full body moves. This includes sled pulls, overhead squats, farmers walks and anything else that involves, "picking up heavy things off the floor, putting them over your head, and carrying them around."